What's it about? 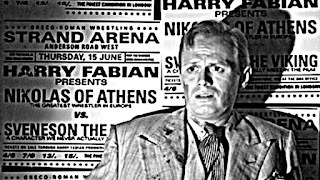 Harry Fabian (Richard Widmark) is a small-time huckster with big-time aspirations, schmoozing his way through the London underworld. When he gets his chance to muscle in on the lucrative wrestling business in the city, he thinks a life of ease and plenty is within his grasp. But in the best noir tradition, Harry isn't as smart as he thinks he is, and powerful forces are conspiring against him. Is it any good? Excellent. It has a strong story and great characters, none of whom are particularly likeable, but their schemes and interactions are never less than engrossing as the film moves inevitably to a non-happy ending. In the lead role, Widmark is superb as Fabian - watch how his smart patter and cocksure attitude slips occasionally to reveal a pleading desperation in his eyes, a desperation which increases as the pressure on him builds. And still he clings to the belief that he could have made it big; self-delusion has rarely been so painful to watch. It's a remarkable central turn, but the real achievement of the film is that, with a beautifully economical script and wonderful performances, every character is given depth and motivation for their actions. There may not be many sympathetic characters in this film, but that doesn't mean we can't get emotionally involved in their fates. 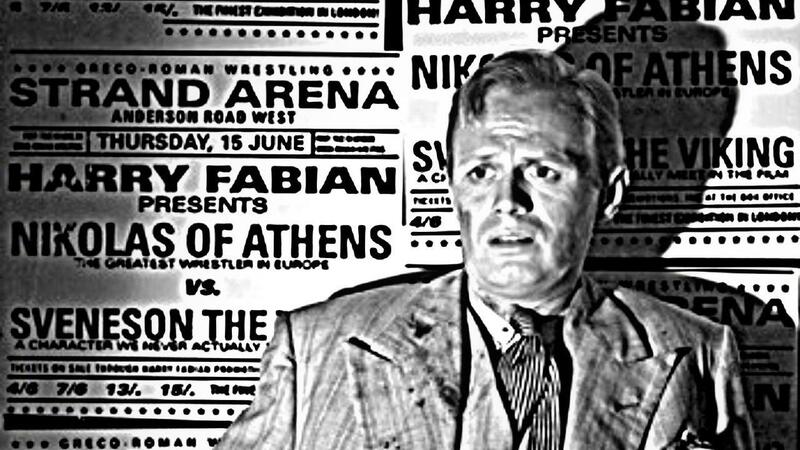 Only the father-son relationship between wrestler Gregorius (real-life wrestler Stanislaus Zbyszko) and hood Kristo (a menacing Herbert Lom) feels a bit like a plot device, whilst Gene Tierney as Fabian's love interest is a bit underused, but these are minor quibbles in an otherwise perfectly assembled piece. (I also particularly liked the threatening visit of the soft-spoken Mr Chilk in a small scene - surely the inspiration for Kobayashi's visit in The Usual Suspects?). 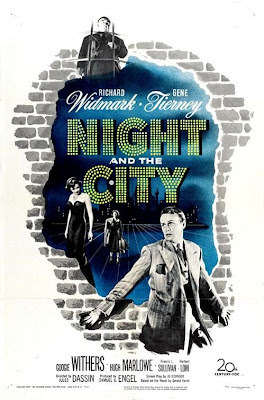 As for how it looks, director Dassin is faithful to the aesthetic traditions of film noir and astutely films the city as one big net, with lines and shadows criss-crossing the screen and characters, emphasising how all these little fishes are trapped in various ways. From the ropes of the wrestling ring, to the cage-like shadows on a club-owner's office walls, to the labyrinthine, dead-end streets, this approach lends a claustrophobic mood to proceedings, which aptly reflects the fatalistic story. All this and it has the best wrestling match I've seen since Big Daddy v Giant Haystacks, circa 1981. Highly recommended. Anything else I should know? Various film scholars have suggested that the film reflects personal anxieties in Dassin's life at the time. Caught up in the anti-communist hysteria in Hollywood, he was under threat of being blacklisted for testifying before HUAC and was essentially exiled to England to avoid that fate. On arrival in London, he set about making Night and the City, the nihilistic tone of which apparently reflecting Dassin's disgust with the betrayal and ambition-at-all-costs nature of Hollywood. Naturally, such a suggestion meant the film received scathing reviews back in the US. Only in the 60s and 70s was it reassessed and is now considered a classic in the noir genre. It was remade pretty faithfully in 1992 with Robert de Niro starring, but don't bother with that, just seek out the original. What does the Fonz think? Good Night and Bad Luck!